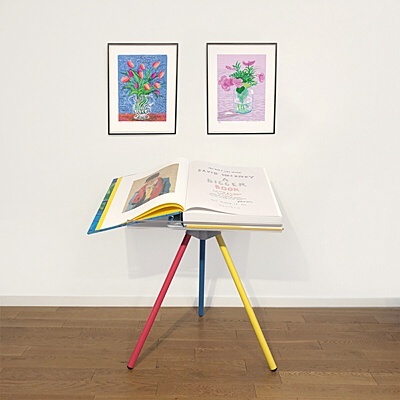 Michael Craig-Martin (b. in Dublin in 1941) is one of the most important and influential artists of the English and Irish art scene. He grew up in the United States and studied at the Yale University School of Art and Architecture but spent most of his life in Great Britain. From 1974 to 1988, he taught at Goldsmith College London. 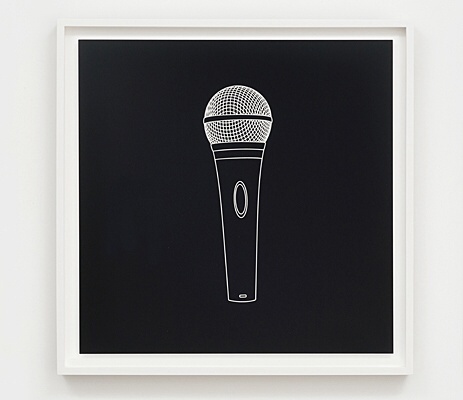 His students included Liam Gillick, Damien Hirst and Julian Opie. From 1989 to 1999, he was a member of the Board of Trustees of the Tate Gallery. Since 1969, he has participated in numerous British and international exhibitions, including the ground-breaking exhibition of British conceptual art The New Art at the Hayward Gallery in London in 1972. Since then, he has exhibited worldwide and created large-scale murals for museums, art associations, galleries and churches. Craig-Martin is a conceptual artist. For him, the question of the presence of artworks is an important, if not the central idea of his entire oeuvre. For fifty years now, his work has consisted of complicating and exposing and at the same time seemingly simplifying the manifold conceptions of our relationship to the things which we create, and which surround us. He decided to make real objects the subject matter of his paintings  simple arrangements of everyday objects. They are objects that are (...) all very commonplace, easily recognizable, artificially produced, reproducible and machine-made, as he himself has said. Objects are chosen with the intention of going beyond one-dimensional interpretations. They are objects of our time, but yet they also appear timeless in their form reduced to the line and their weightless monumentality. "What an artist is trying to do for people is bring them closer to something, because, of course, art is about sharing: you wouldn’t be an artist unless you wanted to share an experience." "I'm Dreaming of a Black Christmas"
on Wednesday, the 23rd of January 2019, at 6:30 p.m. The exhibition will be accompanied by a fully illustrated catalogue (104 pages and more than 90 images (price Euro 10). "This is Shahnoza in 3 parts. 09"
"Some Poems of Jules Laforgue"
Everything is arranged simply and legibly, full of the complex interaction between reality and illusion. The pictures grasp the essence of things and figures in their simplest form and yet remain unsuitable for making simple statements about our present. Time and again, it is left to the viewer to complement and complete the work. It is an interplay between the perceived and one’s own experience, as well as an invitation to expand what has been found by adding what one thought about it oneself. The pleasure of seeing thus also includes knowledge and autonomous thinking. "Quelques poèmes de Jules Laforgue"
I’ll take my life monotonous." "She left yesterday. Perhaps I mind? Ah yes! So that’s what hurts!" 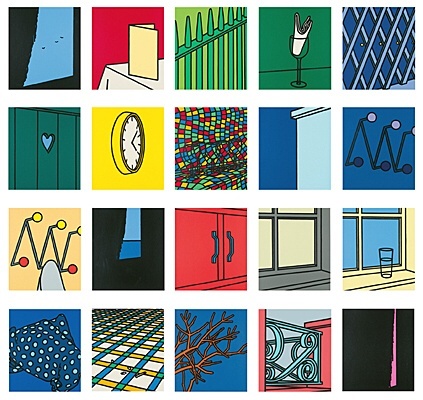 Patrick Caulfield is one of those painters who did not like it when the term Pop Art was used in connection with their work. But despite his resistance to any categorisation, his themes and motifs, as well as his artistic methods, resulted in lastingly relevant icons of British Pop Art. Born in London in 1936 and deceased there in 2005, he studied at the Chelsea School of Art from 1956 to 1960 and, together with David Hockney and R. B. Kitaj, at the Royal College of Art in London from 1960 to 1963. While still a student, he participated in the Young Contemporaries exhibition in London in 1961. After completing his studies, he returned to the Chelsea School of Art as a lecturer from 1963 to 1971. In 1964, he was one of the artists who participated in the Pop Art exhibition New Generation at the Whitechapel Gallery in London. Since then, his work has been presented in numerous British and international exhibitions. 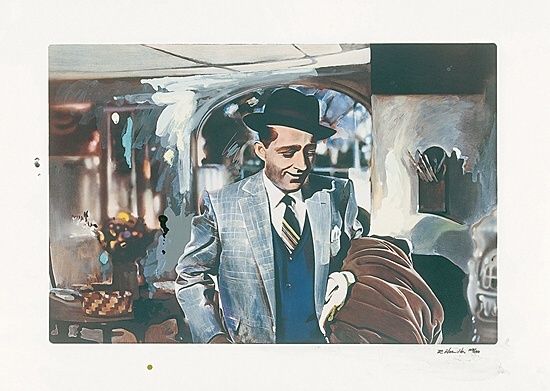 In 1964, Caulfield produced his first prints. Over the years, they became increasingly reduced, schematic and direct. Formal considerations were his primary concern. They focus on the relationship between a clearly defined form and a strong, nuance-free colour. In his efforts to make a formal solution which otherwise might have seemed rather hermetic more easily accessible, he appropriated imagery from the world around him. Printmaking became an essential form of expression for him. Caulfield was a master of visual illusion. The objects and rooms depicted so simply are full of innuendos and allusions. Caulfield found a kindred spirit in Jules Laforgue (Montevideo 1860 – 1887 Paris). Witty, ironic and full of melancholy, Laforgue described in his texts, poems and stories the small, simple things of everyday life, the mundane circumstances of daily life. 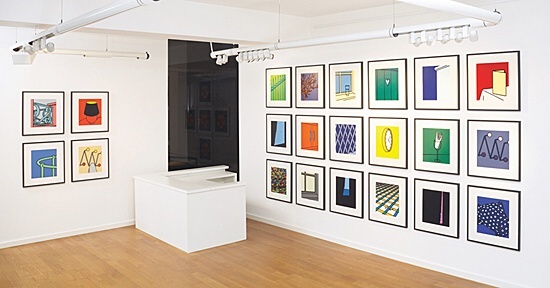 The edition on view in the exhibition, Some Poems of Jules Laforgue (1973), contains twenty-two prints by Patrick Caulfield and twelve poems by Jules Laforgue. The bibliophile books in English or French are supplemented by signed individual pages from special editions of the respective book. The lamps and windows, the abandoned restaurants in their sharp-angled geometry of light and shadow, the slightly open curtains, the empty coat stands and flower vases make visible what is not visible. They tell of happiness and sorrow, of rendezvous that have taken place or not been kept, of a zest for life or loneliness. In their isolation, the objects and motifs are testimony to their own selves. "I am trying to present objects in the simplest way possible, and I don’t want to supply too much context. All the basic information should be in the object itself. The viewer brings all additional information to the image. 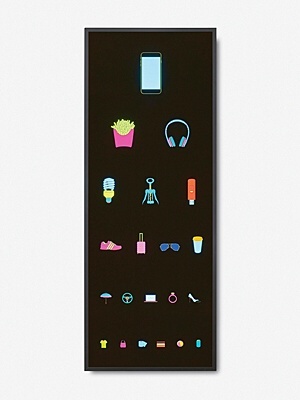 Many of these objects are mass manufactured. They are essentially impersonal, but if you own one, it’s very personal. The identifying personal association with these objects, which are not personal, is an important modern experience − our real association, the strands of our feelings about the objects that surround us. It’s also because they are so familiar, we don’t think of them as important in the world, but actually they are the world. We are living in a very material world." 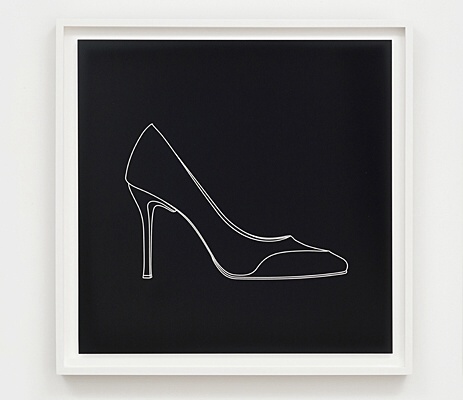 Born in Dublin in 1941, Michael Craig-Martin is one of the most important and influential artists of the English and Irish art scene. He grew up in the United States and studied at the Yale University School of Art and Architecture but spent most of his life in Britain. From 1974 to 1988, he taught at Goldsmith College London. 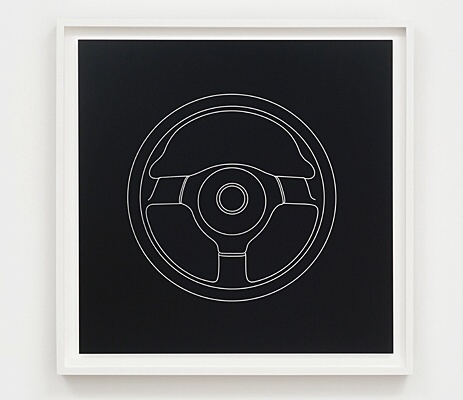 His students included Liam Gillick, Damien Hirst and Julian Opie. From 1989 to 1999, he was a member of the Board of Trustees of the Tate Gallery. Since 1969, he has participated in numerous British and international exhibitions, including the ground-breaking exhibition of British conceptual art The New Art at the Hayward Gallery in London in 1972. Since then, he has exhibited worldwide and created large murals for museums, art societies, galleries and churches. Craig-Martin is a conceptual artist. For him, the question of the presence of works of art is an important, if not the central idea of his entire oeuvre. For fifty years now, his work has consisted of ‘complicating and exposing and at the same time seemingly simplifying’ the manifold conceptions of our relationship to the things which we create, and which surround us. He decided to make real objects the subject matter of his paintings – simple arrangements of everyday objects. They are ‘objects that are [...] all very commonplace, easily recognizable, artificially produced, reproducible and machine-made’, as he himself has said. Objects are chosen with the intention of going beyond one-dimensional interpretations. They are objects of our time, yet they also appear timeless in their form reduced to the line, in their weightless monumentality. "Poured Triptych Etching: Ambassadors (After Holbein)"
"On a number of occasions over the years I have found things that have happened in the print studio that were completely unpredictable. For example, when printing my etchings, there is a ‘ghost image’ that occurs within the technical process. I asked if the print studio could print it up, and in fact it looks really beautiful. It has a very different, softer quality which was very unexpected." 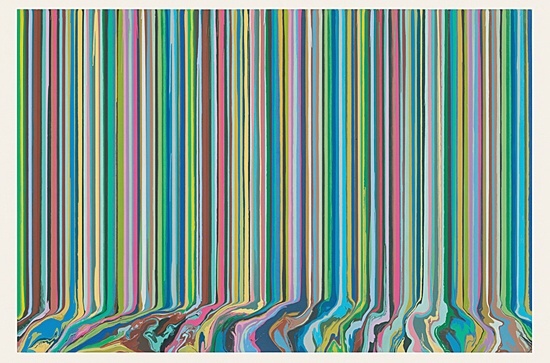 The trademarks of Ian Davenport are his Poured Lines and Puddle Paintings, with which he became internationally successful and developed his artistic independence. Poured Lines, his fifty-metre-long wall of colour under a railway bridge in the south of London, attracted international attention. One day, in search of a new artistic direction, Davenport observed the flow of a drop of paint. The gravity that let it flow downwards and the randomness of the path it took inspired Davenport to experiment with this. Davenport applies the paints with a syringe along the upper edge of the picture and lets them flow downwards on thin sheets of steel. Initially, he let the drops find their own way. The result was irregular lines; the drop of paint moved downwards in a slight curve, and chance determined the pictorial composition. Davenport then began to steer the paths of the drops of paint. They became straighter, linear. The early randomness increasingly disappeared. For the Puddle Paintings, he interrupts the flow of paint by bending the lower part of the metal sheet to a horizontal plane, on which the lines of colour flow into ‘puddles’. Born in Kent in 1966, Ian Davenport studied at Goldsmiths College of Art in London and was nominated for the Turner Prize in 1991. Blatt 4 der Serie "100 Years Ago"
"In a way, I try to find images that have a sound rather than a meaning." The British painter Peter Doig, who lives and works in Trinidad, London and New York, has created inimitable visual worlds. Born in Edinburgh in 1959, he grew up in Trinidad and Canada. His motifs, which generally depict people in nameless landscapes, suggest pictorial sources of his homeland; it is, however, not memory that interests him, but rather the idea of memory. Peter Doig was nominated for the Turner Prize in 2008 and received the Wolfgang-Hahn Prize of the Museum Ludwig in Cologne that same year. "You can do things in print you can’t do in any other medium." Brit Pop established itself as an independent movement earlier than Pop Art in the USA. What began as early as 1952 around the artists of the 'Independent Group' was to be perfected in the USA in the 1960s. 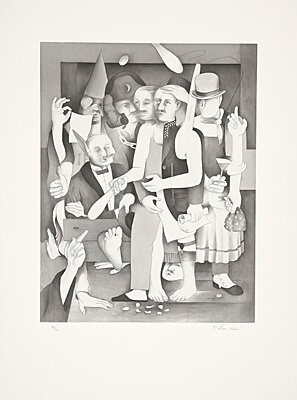 The main protagonist of this small group of young painters, sculptors, architects, authors and critics was Richard Hamilton. Born in London in 1922, Hamilton designed the poster for the legendary exhibition This Is Tomorrow (1956). Hamilton's collage Just what is it that makes home so different, so appealing? is a veritable incunabulum of early British Pop Art. From 1938 to 1940, Hamilton studied painting at the Royal Academy School and, from 1941 to 1945, earned his living as an industrial designer. He resumed his painting studies at the Royal Academy School in 1946 but was expelled in July that same year for not following the directives of his teachers. This was followed by studies at the Slade School of Art in London from 1948 to 1951, where he dealt primarily with the medium of the etching. After a trip to New York in 1963, he began to combine photographic and painterly elements in his pictures, followed in the 1980s by an intensive examination of the possibilities of digital media and their effects on image perception and the visual arts. Printmaking has held an outstanding position in Hamilton's work since the late 1930s and stands on an equal footing with his other artistic activities. A virtuoso mastery and combination of various printmaking techniques led to the creation of an extraordinary and diverse oeuvre. In 1992, the Tate Gallery in London presented a retrospective and, in 2003, the Museum Ludwig in Cologne organised an exhibition of his works under the title Introspective, conceived in cooperation with the artist. 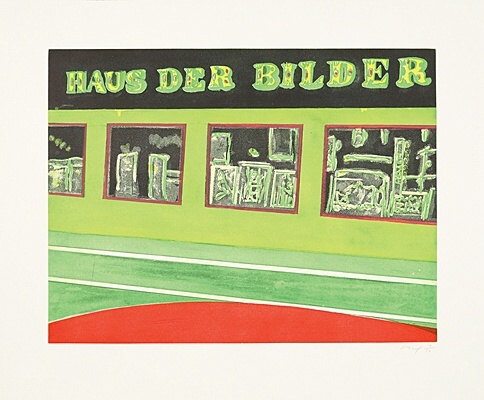 In 1993, Richard Hamilton represented Great Britain at the Venice Biennale. The Tate Gallery boasts an important collection of his works. David Hockney is one of the most influential contemporary European artists. He became famous above all for his Swimming Pool paintings of the 1960s, his sensitive portraits of friends and his parents, his still life motifs and landscapes, his photo-collages and stage sets. Landscape painting, more of a stepchild of contemporary art, has become the focus of his work in recent years, as a remarkable exhibition at the Museum Ludwig in Cologne demonstrated. The visitor was confronted with a veritable festival of colour. Hockney has always been open to new techniques. Early on, he used Polaroids for his work, as well as colour copiers and fax machines. In addition to traditional painting, he has been experimenting with screen drawings for years. With his iPhone and iPad, he creates images that radiate a strong, colourful vibrancy and demonstrate his masterful command of printmaking techniques. "My philosophy is paradox. I am of a logical cast of minds, and find common sense hopeless. Philosophers have found paradox cropping up at the crux of every enquiry, and have tried to explain away this vicious circularity. I embrace the contradictory and celebrate the paradoxical. A paradox to me is like a pearl." The perception of illusion and reality is a key theme of in the art of Patrick Hughes. Born in Birmingham in 1939, the English artist has established an international reputation as a painter of paradox. His painted reliefs are ‘moving’ images that make use of reverse perspective. With illusionistic compositions, he confronts the viewer with the play of constantly changing perspectives. The reversal of the conventional is intended to demonstrate to the viewer how entrenched our viewing habits have become – the conditioning of human perspective is so strong that it negates all other experiences of space. Patrick Hughes’s methods seem paradoxical, yet they reveal an impressive consistency. His works are intended to surprise, irritate and inspire contemplation, to sensitise consciousness for space and movement. The preferred motifs of his paintings and multiples are architectural views, with a preference for Venice, picture galleries, combinations of doors, and landscape views. 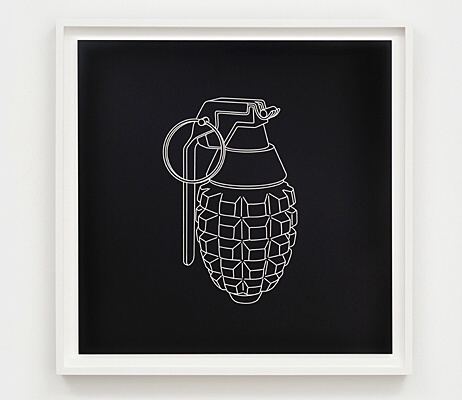 With his most recent works, he pays tribute to the British Street Art artist Banksy. In addition to the unique pieces painted on wood, numerous multiples are also on view in the gallery. 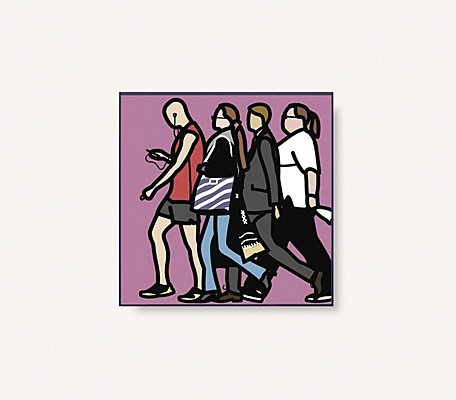 "I want to strip things down, to look at them for what they really are …"
Julian Opie, born in London in 1958, has been one of the most important representatives of contemporary English art for nearly three decades. Opie’s inimitable pictorial language consists in the reduction of individual characteristics. The human figure, the subject, is reduced to characteristic peculiarities of physiognomy. ‘For each person I draw, I try to create a universal symbol‘, Julian Opie could not have characterised his own work more concisely. In his works, he deliberately explores the limits of stylisation, which is particularly evident in the ‘moving’ lenticular objects. Here, high-resolution images are combined in the computer by means of a complex process. The resulting image structure is then printed mirror-inverted onto the lenticular material from behind with great precision. In his computer-animated works, Opie brings movement into these reduced representations of people. For this, he works with flat screens or monitors, on which the computer-controlled animations present a permanent flowing movement. A surrealistic effect results from the lack of space in the image, the only spatial reference of which is the frame of the monitors. 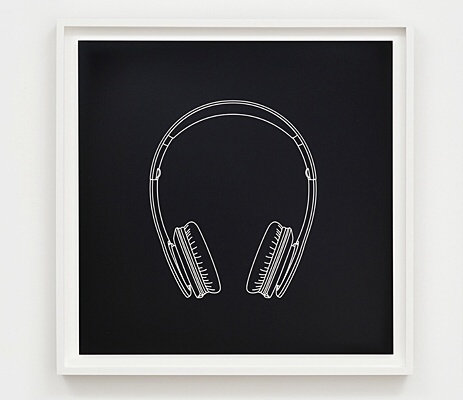 From 1979 to 1982, Julian Opie studied at Goldsmiths College, London. His works have been realised in a variety of media. The immediately recognisable, universal language of his art is unique and comprehensible worldwide. In 2001, he received the Music Week CADS, Best Illustration Award for his album cover design for Best of Blur. His works have been presented worldwide in private and public spaces and are included in major public collections around the world. All the works shown in the exhibition combine perfection and technical skill with the pleasure of seeing, knowing and thinking.